Today we visited Arlington National Cemetery just outside Washington DC – within feet of the Pentagon’s continent size parking lots. 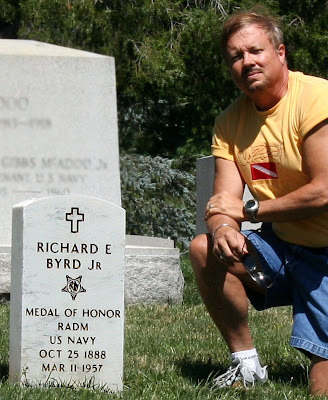 As I considered who it was I wanted to “visit” at the national cemetery, it became immediately obvious to me that it would be the gravesite of Admiral Richard E. Byrd – the great early 20th century explorer. Upon arrival, I looked Admiral Byrd’s site up on the map and off we went to find the grave plot of one of my childhood heroes. In the 5th grade, I clearly remember reading the account of Admiral Byrd’s harrowing exploration of Antarctica. He decided for still unclear reasons to man single-handedly an Antarctica weather station some 123 miles from the nearest base – all alone – and totally out of reach of any rescuers that he may have needed for whatever reason. He wrote of this adventure in a book aptly titled, ALONE. It was truly an amazing account for a young boy who would later grow up to be an explorer himself. The primary lesson I gleaned from Admiral Byrd’s account was that true exploration was equivalent to struggle in the field and genuine adventure was invariably linked with its uncertainty. Anything else did not equal true exploration but more of a complicated camp-out pre-ordained by advanced press releases.